There were 15 billion payment cards in circulation around the world at the end of 2017, up by 6% since the end of 2016, according to RBR’s most recent report, Global Payment Cards Data and Forecasts to 2023. As governments and central banks in developing markets continue to encourage financial inclusion, the number of cards has kept growing, providing further opportunities for card schemes. Growth in the Chinese card market has been strong for several years and the trend continued in 2017 which saw the number of cards in issue rise by 9%. 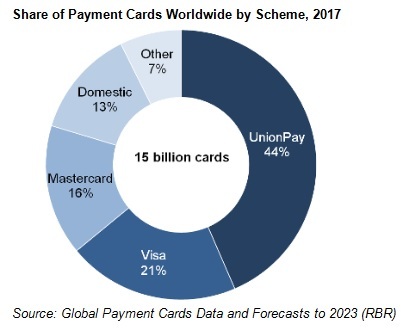 The vast majority of the country’s cards are UnionPay-branded, and in 2017 the scheme accounted for 44% of the world’s payment cards, increasing its share by one percentage point compared to the previous year. Visa (including Visa Electron, V PAY and Interlink) and Mastercard (including Maestro and Mastercard Electronic) account for 21% and 16% of global cards respectively; if China is excluded, Visa’s share is 36% and Mastercard’s 27%. The RBR report shows that domestic schemes, usually found in the debit sector, are declining in most markets, as they are either dual-badged with, or replaced by, international schemes. However, they have seen something of a rebirth in a number of large markets in recent years. For example, India’s RuPay’s important role in a financial inclusion campaign has seen its share of the country’s cards rise to 49% since its launch in 2012. For many years, Visa and Mastercard cards in China were dual-badged with UnionPay, but a 2017 regulation prohibiting dual-badging means that this is no longer the case. As all Chinese cards issued for domestic use must be UnionPay-branded, banks are typically issuing UnionPay-only cards to replace existing dual-badged ones, while customers can request an international card for use abroad. RBR’s Daniel Dawson, who headed up the research team, said: “While some Chinese consumers and businesses will request a Visa or Mastercard card, UnionPay will account for the vast majority of Chinese cards for the foreseeable future. UnionPay will also aim to expand internationally, but Visa and Mastercard’s long history in other markets will enable them to withstand pressure from new competitors”.